“Portraits for Pixels” is an annual campaign for portrait photographers worldwide getting on board to raise funds and awareness for The Pixel Project. Participating photographers organise special “Portrait for Pixels” charity portrait sessions in their communities during August and September. 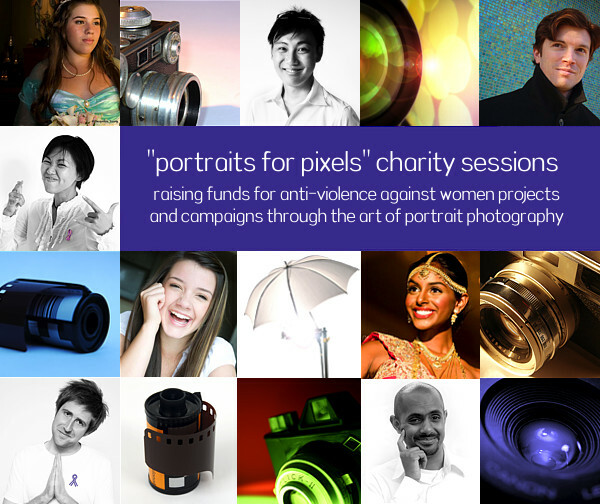 A percentage of the fees (at a minimum of US$10 per portrait session) from the fundraiser is then donated to The Pixel Project to keep our anti-Violence Against Women campaigns and programmes alive and running. Participating photographer enjoy a number of benefits including individual gallery pages showcasing selected pictures from their portfolio, being featured in a special spotlight interview and being introduced to The Pixel Project’s fast-growing social media communities. Interested in taking part? Click on the button below to learn more about registering as a “Portraits For Pixels” photographer.